The Bear Deluxe Magazine is the quarterly publication of of Portland, OR non-profit, Orlo. The issue in review – #28 – is the contemporary art issue. Orlo’s mission is to explore environmental issues through the creative arts, and the art work and conversation presented in the magazine is thus environmentally-focused. First of all, the magazine’s design is really beautiful. The layout is interesting and fun and filled with color images. 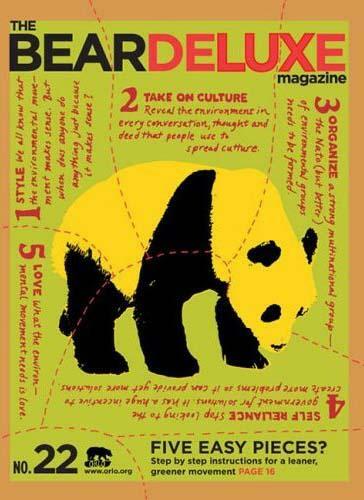 It is no wonder that The Bear wins design awards so often, including Print magazine’s Regional Design Annual Certificate of Design Excellence for 2008, 2005, 2004, 2003, and 2002. Accompanying this issue is Orlo’s blog “Landscape and Canvas” that tracks the development of the contemporary art issue and also serves as a virtual interview space with Stephanie Smith – director of collections and exhibitions and curator of contemporary art at the Smart Museum of Art at the University of Chicago. The interview is featured in the print issue. The conversation revolves around the theme of place, Smith’s exhibition Beyond Green: Toward a Sustainable Art at the Ronna and Eric Hoffman Contemporary Art Gallery at Lewis and Clark College, the involvement of the audience or viewer, and the problems of defining art that finds its voice through or talks about in some way the environment – should it be called “sustainable art,” “place-based,” “environmental art,” or “eco-art?” Smith answers that she refers to this art practice as “sustainable” because it lends itself to more than just issues surrounding the physical environment. I enjoyed many of the projects presented in issue #28. I really was into the collaboration Maslen + Mehra’s Mirrored and Native series. For these series, they produce silhouettes of animals and people with mirrors and place them within either urban (the animals – Native series) or natural (the humans – Mirrored series) environments. They then document these interventions with photographs. The photographs seem to be digital manipulations, but they are not. The images depict the juxtapositions and reflections of the particular environment on the mirror animal or human. The series points out the interconnectedness of the subjects and environments; each is affected by the other.